Want a functional way to dress up your space? Pipe and drape is commonly used to add style to Michigan wedding receptions. Drapery is ideal for situations with facilities that are in dire need of a remodel. You can use the cloth to cover up walls that you want to hide. Since the fabric is white, it reflects color. This means that you can have lighting fixtures placed in-front of the pipe and drape to create a dramatic backdrop. Just imagine the possibilities with a color changing backdrop. 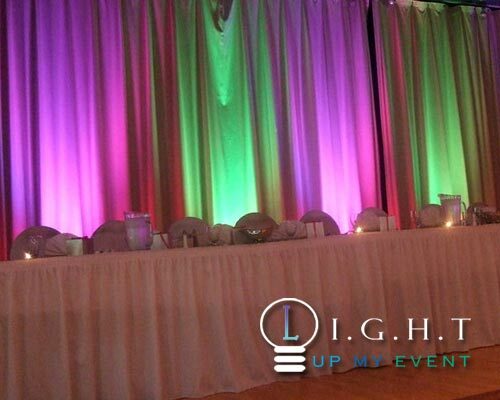 You can place the back drop behind your head table, even have it match the same colors of your event. It is a great way to cover up ugly walls. Since pipe and drape is charged per/foot, it is best to contact our studio to get an extra quote.